HOLLYWOOD, FL--(Marketwire - September 22, 2010) - ResumeSponge, www.resumesponge.com, has officially launched a web-based medium designed to address significant shortfalls in today's online job board and professional social networking marketplace, and help people better stand out from the crowd and achieve more success in all their career and employment endeavors. Packed with a powerful package of advanced, proprietary features, ResumeSponge enables users to better showcase their skills, talents and expertise by delivering new technologies that market their professional work in a more compelling, effective way. With ResumeSponge, anyone can build a professional online presence unlike the world has ever seen. While in beta, ResumeSponge currently supports Google Chrome, Safari and Mozilla Firefox with Internet Explorer support coming very soon. With millions of people searching for employment and companies investing significant dollars to find, attract and recruit top talent, the marketplace needs a one-stop solution that delivers tangible results for everyone. Currently, the marketplace is filled with companies utilizing old technology and building their companies based on money-centric business models. For users, this brings high costs and poor-quality, low-end results. ResumeSponge improves these inefficiencies by giving consumers and recruiting professionals more options on how they can network, communicate, collaborate, showcase themselves, and opportunities in a whole new way for pursuing success and driving results in today's crowded job market. 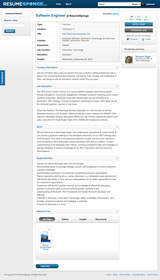 "ResumeSponge is an amazing product designed specifically to help others. Our powerful, web-based platform is filled with proprietary technology and advanced features that traditional online job boards and other professional social networking sites are lacking. We're breaking the constraints of the marketplace and empowering users to take more control of their entire career and employment initiatives. People will love using the site and getting tangible results both online and in the real world. We'll be rolling out even more features in the next few months, so there's much more to come," said Solomon Engel, founder & CEO. Build a professional online presence unlike any other. Today's web sites don't allow you to fully elaborate on your finest attributes and expertise to make a good first impression and stand out from the crowd. More importantly, profiles filled with in-line text alone just don't tell the whole story and they aren't very good at presenting the most of what you can offer. Profile from ResumeSponge is packed with advanced technology integration, and lets users attach documents, videos, and photos, providing them with the ability to showcase more of their talents and professional work than on any other site today. Market opportunities more effectively. ResumeSponge Jobs lets users discover, create, manage and engage on opportunities in a way that makes them more successful. It's the best place to create jobs on the web. Users can describe their opportunities, then add relevant documents, videos and photos to put their opportunities center stage. With Jobs from ResumeSponge, users can attract top talent, and market their opportunities in ways that are not currently offered by any other single medium. Communicate, Collaborate and share your professional work like never before. Today's web mail systems are very basic, do not encourage collaborative group conversations, and provide no control over attachments once they're sent. In addition, professional social networks typically charge a fee for usage of their very basic mail systems unless you're directly in connection with the intended recipient. ResumeSponge delivers SpongeMail, a highly advanced mail system taking the best of some very well known, industry systems and adds enhancements that specifically meet the needs of its users. 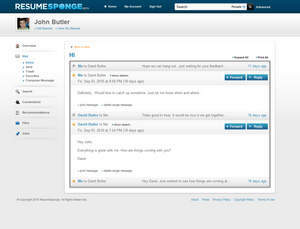 With SpongeMail, people can easily share all types of files and content within interactive threaded messages. There is no need to download software or files; attachments are viewed within ResumeSponge's vivid viewers, making for simple, secure and a great viewing experience. In addition, users have the ability to maintain control over their most valued attachments by restricting recipients' ability to download, forward, print, or share them. Take recommendations offline, and put them to use in the real world. Recommendations posted on professional social networking sites, as well as throughout the web, aren't always taken as seriously when compared to original letters of recommendation. ResumeSponge takes the positives of what others think of you, and lets you put them to use in the real world. You can write a recommendation, sign it, and ResumeSponge certifies it. View your recommendations with a click, and then download them to take with you to job interviews or incorporate them in your portfolio. Upload all your career, professional, and personal files in one secure place. Files from ResumeSponge allows you to upload all the most commonly used file types, including Microsoft Office documents, PDFs, and all major video and photo formats. You decide what you want others to see by displaying your files publicly, or keeping them private. Browse through your files with a flick of your mouse, and display them in ResumeSponge's beautifully designed viewers. 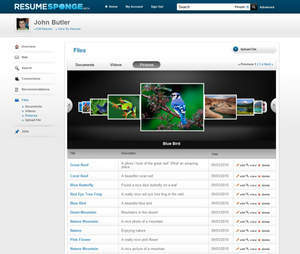 With no storage limitations, Files from ResumeSponge is the best place to store and manage all your professional work. ResumeSponge is a Social Career Platform built to help people achieve success throughout their career and employment initiatives. It is for anyone seeking an innovative way to market themselves, stand out in the crowded job marketplace, discover and create compelling opportunities, collaborate more effectively with colleagues, classmates, business professionals, and drive results. For more information, please visit www.ResumeSponge.com.